One can make a good argument that the backpack should be the last item you choose when selecting your gear for the John Muir Trail. I make that case in “Planning Your Thru-Hike of the John Muir Trail.” After all, you need to know the size, shape, and weight of what you intend to carry prior to settling on a backpack. I’m going to cover it first because, with the possible exception of footwear, it’s the item you must be most careful about in regards to fit. There are two critical sizing decisions you need to make, one that’s pretty obvious and one that can be a bit tricky. The obvious one is cargo compartment. Not only does the total volume need to be sufficient, but the shape of the compartment needs to be correct as well. You’re going to be carrying at least one (and possibly two) bear canisters, and they need to fit comfortably inside the backpack. Since your bear canister is one of the few items you’ll carry that varies in weight, you’ll also want to make sure that it fits into the bottom of the pack (when it’s near empty and light) and the top of the pack (when it’s full and heavy). I’ve seen some hikers hang the bear canister, swinging, from the bottom of their backpack (a dreadful solution) and some secure it to the top (not as bad, but still not optimum, especially if it’s empty or nearly so). Get a pack large enough to position your canister properly. The other critical measurement is to match the pack to your torso. If you go to your favorite recreational equipment store and ask for help, and if the person helping you asks how tall you are, thank him for his help and find another member of staff – or another store. A great explanation of how to measure your torso, and then how to use that measurement to get a good pack, can be found here. 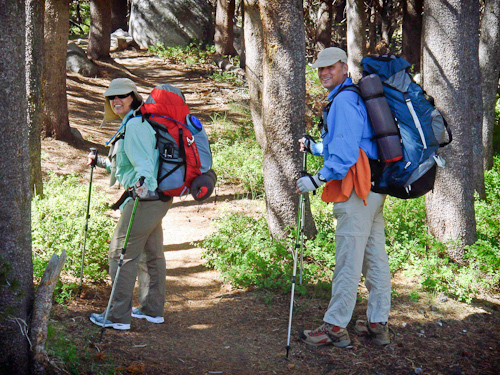 Hiking the John Muir Trail requires an enormous number of striding repetitions. If each pace requires a rub, scrape or other irritation, you are soon going to be miserable. Get a backpack that fits!